Stumbling across a new place is what makes traveling so magical, But of course, it certainly never hurts to research a thing or two about the area before you hurry off. Read on and discover some basic facts about Lun. This town is 15 miles (24 kilometers) away from Senj and 30 miles (48 kilometers) from Gospic. It shouldn't be hard to make new friends in this part of Zadar. It has a population of some 300 locals. Get a fantastic price on your getaway to Lun by packaging your accommodation and airfare bookings. You can also choose from more than 400 airlines and 665,000 places to stay. From airfares and accommodations to activities and rental cars, we can offer 24/7 personal assistance with our Customer 1st Guarantee. Seen a better deal elsewhere? We'll meet the price and give you back the difference^. We're aware that unforeseen situations can arise. If you decide to adjust your travel bookings, you will never have to pay us a hidden fee. And so long as you get in fast, most accommodations won't charge a fee either^. Lun isn't exactly known for its massive assortment of accommodations. That said, with 9 properties on offer via Travelocity, you should be able to find what you're after pretty easily. Book your room now so you don't miss out! If you don't want to waste time sifting through the web for places to stay in Lun, don't stress. We've done all the work for you. 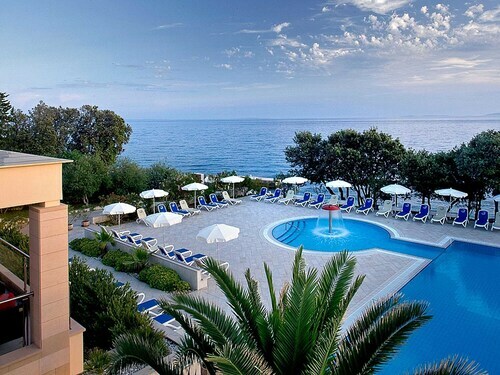 Our recommended accommodations here are the Arbiana Hotel and Valamar Padova Hotel. Where do you fly into for Lun? Bags all packed? Fantastic — board a plane to Rijeka Airport (RJK). Once you hit the runway, you'll be just 40 miles (64 kilometers) to the north from the main streets of Lun. Can I rent a car in Lun? Forget the hassle of buses, trains and expensive cabs. If you want to do some exploring in Lun, it'd be wise to rent some wheels via Travelocity. We make it so easy that you'll be crafting your favorite playlist in no time at all! You never know what things could end up on the shore at Pudarica Beach. Take off your shoes and wander along the water to see if you stumble across a message in a bottle. Want some more options? Enjoy the fresh sea air as you meander along Rab Harbor. Bobbing around in the twinkling bay, the moored boats look especially beautiful as the sun is setting. And that's not all. Do you feel like a picturesque evening by the shoreline? Bring a picnic rug and find the best spot to bask in a stunning ocean sunset at Frkanj Beach. Lun is only 40 miles (64 kilometers) from Liznjan. Use this locality to access a range of attractions, including Pula Arena and the Temple of Augustus. Just 45 miles (72 kilometers) away you'll find Kalelarga, another nearby area that's well worth a visit. It's a handy base to access amazing attractions like Forum and Church of St. Mary's. Situated in Novalja, this spa hotel is within 12 mi (20 km) of Novalja City Museum, Zrce Beach, and Planjka Beach. Strasko Beach is 11.5 mi (18.5 km) away. Located on the waterfront, this family-friendly hotel is 11.5 mi (18.5 km) from Zrce Beach and 25.4 mi (40.8 km) from Zavratnica Inlet. This Novalja apartment building is on the beach, 0.1 mi (0.1 km) from Kvarner Gulf, and within 16 mi (25 km) of Planjka Beach and Strasko Beach. Zavratnica Inlet and Novalja City Museum are also within 32 mi (52 km). Located in the heart of Novalja, this property is 0.1 mi (0.1 km) from Kvarner Gulf and within 16 mi (25 km) of Novalja City Museum and Planjka Beach. Strasko Beach and Zavratnica Inlet are also within 32 mi (52 km). Located in the heart of Novalja, this vacation home is 1.4 mi (2.2 km) from Kvarner Gulf and within 12 mi (20 km) of Novalja City Museum and Planjka Beach. Strasko Beach and Zavratnica Inlet are also within 32 mi (52 km). 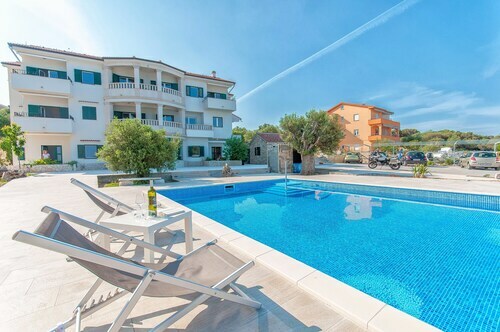 Located in the heart of Novalja, this apartment building is 3.5 mi (5.7 km) from Kvarner Gulf and within 12 mi (20 km) of Zrce Beach and Novalja City Museum. Planjka Beach and Strasko Beach are also within 12 mi (20 km). Located in the heart of Novalja, this property is 3.5 mi (5.6 km) from Kvarner Gulf and within 12 mi (20 km) of Zrce Beach and Novalja City Museum. Planjka Beach and Strasko Beach are also within 12 mi (20 km). Located in the heart of Novalja, this property is 0.6 mi (1 km) from Kvarner Gulf and 12.1 mi (19.6 km) from Novalja City Museum. Planjka Beach and Strasko Beach are also within 16 mi (25 km).